How do we fill those shoes? To continue our legacy of excellence, this international award-winning chorus located in Colorado Springs, Colorado, is looking for a new director. Look For Our Competitors in Las Vegas! Region 17 is pleased to announce that we will be sending TWO quartets to the Sweet Adelines International competition this year in Las Vegas. Watch Our Competitors in Baltimore! We have THREE competitors in Region 17 for the International Competition in Baltimore this year! 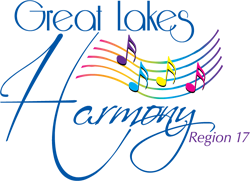 Wednesday, November 5, 2014 NATURALLY will compete in the quartet semifinals.